If you think American couples are simply saving for their golden years, you’d better guess again. Based on the results of a recent NerdWallet study, it’s clear that people are stashing away their hard-earned dollars for a variety of reasons. 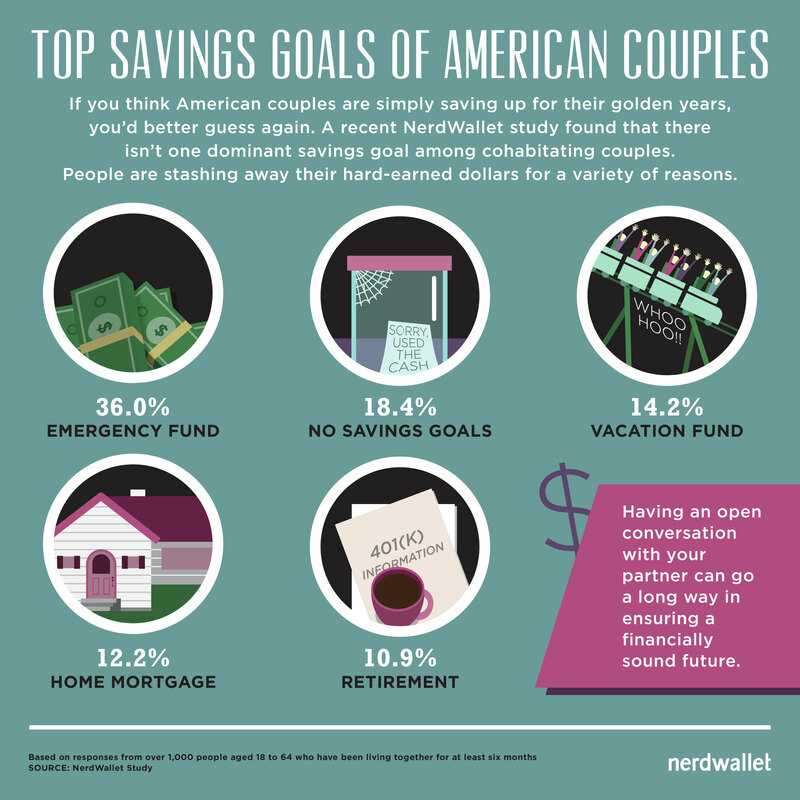 Here’s a closer look at couples’ top savings goals, starting with the most popular. For 36% of couples, building an emergency fund is the top priority. In a shell-shocked economy that has limped through the last decade, this is perhaps not surprising. Still, it’s never too late to contribute to a rainy-day fund with at least six months’ worth of living expenses. In fact, as job-hopping becomes increasingly common among millennials, having quick access to cash for unexpected costs can be a lifesaver during times of unemployment. Some 18.4% of couples admit to not having a savings goal. Although the reasons for this differ from couple to couple, a lack of communication may be the culprit. After all, about 35% of men and 39% of women say they hide cash from their partner. Talking openly about your finances can help you and your partner identify shared goals and get your saving habits on the same track. Putting money toward a trip is the main goal for 14.2% of couples. According to a report from the Center for Economic and Policy Research, the United States is the “only advanced economy in the world that does not guarantee its workers paid vacation days.” This means that the money we spend on vacation won’t replenish itself while we’re taking time off. But don’t let that keep you at the office—it’s important to relax and recharge, and with a little planning, you won’t have to pass up on a much-needed break. For 12.2% of respondents, saving for a home mortgage is the number one goal. Understanding how a mortgage works can take some effort, but having the money to pay it off is the most basic lesson you’ll have to master. Making your payments on time and in full is an excellent way to boost your credit score, which can help you lock in better rates on other financial products, such as auto loans and credit cards. When it comes to setting money aside, retirement is the priority for 10.9% of surveyed couples. Social Security and pensions can’t realistically be your only support during retirement, so it’s imperative to save money while you’re still working. Fortunately, retirement plans like a 401(k) simplify the process, allowing your employer to automatically deduct a set percentage of your salary during each pay period. Many employers will even match your contribution up to a certain amount. Figuring out what you and your partner’s savings goals are is like hitting the gym after an extended break from the barbells. In both cases, making a plan is the difficult but necessary first step. Having a frank conversation about saving money can go a long way toward ensuring a financially sound future together. Couple with piggy bank image via Shutterstock.